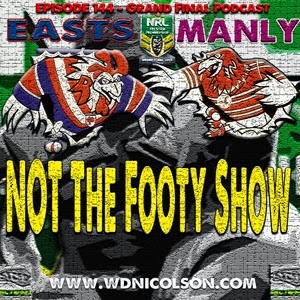 wdnicolson.com - An NRL Blog: #NRLGF Clive Churchill Medal Market: Which Rooster or Sea Eagle actually has a chance to win? So our Tips for the Grand Final are below and after crowning Johnathan Thurston as the @NRLTweet Player of the Year for 2013 - we brought back the @NRLTweet Player of the Finals Award - won by Cooper Cronk last year. You can track Grand Final Votes for #NRLTweetPlayerofFinals and Voting Allocation is below (5 Voters for the Grand Final - all using 4-2-1 Votes) - with the chance of the Clive Churchill Medallist (as chosen by our voters) still a chance of taking out the entire playoff series gong - if he can grab all 20 votes. Latest of Late Mail and Grand Finals Tips below! For our analysis of Tuesday team selections for the Grand Final - click here. 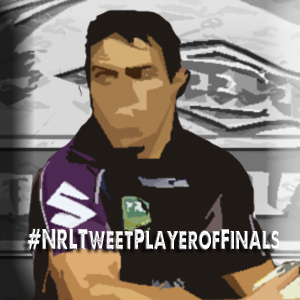 Track live Grand Final votes via #NRLTweetPlayerofFinals - Announcing the Man of the Match and Player of the Finals after full-time. Which team has the best Spine? If like me, you believe that being able to create points it the greatest asset a team's spine has going for it in big games - you'll need to sport some serious weapons in the #1, #6, #7 and #9 jerseys and ladies and gents... Manly have the edge here. Not by a lot mind you, but come fulltime (or golden point fulltime) on Sunday night - the Brett Stewart/Kieran Foran/Daly Cherry-Evans/Matt Ballin combo gets my backing against the Anthony Minichiello/James Maloney/Mitchell Pearce/Jake Friend mix. I'll always take a ball playing playmaker over one that relies on the kick... and Foran might be the best of the lot. That being said I think Maloney is playing out of his skin at the moment, but Foran and DCE get my vote over Maloney and Pearce, Ballin and Friend cancel each other out (both do their jobs superbly), while I'll take Brett Stewart's big play ability over Minichiello's any day of the week... but I might lean towards Mini on the reliable hamstrings front. Which team has the best Strikeweapons? Michael Jennings was the standout three-quarter in the Preliminary Finals. He'll turn a half chance into points and his combo with Maloney is the trump card the Chooks have vs Jamie Lyon's side of the field. Then there's the quality on Easts' wings - with Daniel Tupou and Roger Tuivasa-Sheck far better in the air than the David Williams/Jorge Taufua pair and exposing this must be at least attempted by the Chooks. Shaun Kenny-Dowall will either be brilliant or a passenger and in the pack the Chooks have more potency in terms of breaking tackles than Manly's forwards. Then there's SBW... he's a freak, but I still JUST lean towards Manly because their playmakers are better at creating half chances for their strikeweapons. But it is close. Which team has the best Pack? It's the Roosters and it might be a more pronounced advantage if Boyd Cordner and Luke O'Donnell replace Dylan Napa and Isaac Liu come gameday. Manly's group is mighty good but it isn't as dominant - and the ability of Anthony Watmough to play 80 minutes with a bung knee makes it tough for him to match what SBW can bring to the table. Glenn Stewart will play the creative role but SBW v Justin Horo is matchup I love if I'm the Roosters because as good as Horo has been - he's looked tired in the last few weeks and SBW is going to test him deluxe on Sunday. And depth wise the interchangeable Mitchell Aubusson, Frank-Paul Nuuausala, Aidan Guerra and probably Boyd Cordner - the Roosters just look better equipped for a war of attrition between the backrows. Manly's starting props are good enough with Brenton Lawrence and Brent Kite and their backup is solid with converted backrower Jamie Buhrer and George Rose playing very well lately. But the Roosters counter with Jared Waerea-Hargreaves in career best form, Sam Moa simply doing his job and then either O'Donnell and Liu/Napa will come on for their stint and do what their coach asks of them - keep the momentum going that the starters have produced. Which team has the best Tactics? 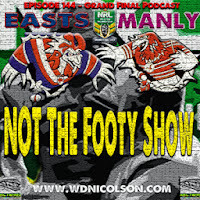 Here is where Manly can beat the Chooks... and Easts can expose Manly. Biggest problem for Manly in these clashes against the Roosters has been taking their chances - they've scored 4, 12 and 0 points in their 3 games this season but have had PLENTY of chances and field position in all 3 games. But the simple fact is - they lost all 3 games and didn't take their chances. So the Manly plan will be hold the Chooks as much as they can in the middle, give Lyon and Matai early ball and TAKE THEIR CHANCES. My Game Plan For Easts - make Matt Ballin tackle, tackle, tackle... he's a machine but he's also the key to Foran and DCE getting clean crisp ball time after time, make him work work work and Manly will find it hard to be as clinical in possession if their physical freak starts to break down from fatigue at the end of each half. Get SBW the ball as much as he wants it and then some... kick, kick and kick to expose Williams/Taufua in the air. My Game Plan for Manly - as Newcastle planned last week, TARGET Maloney/Jennings and Pearce/Kenny-Dowall on the edge and get ready for the missed tackle induced opportunity. Foran in particular has a huge role to expose the Pearce/SKD combo outside SBW. Oh... and take your chances. Okay... go with Manly. 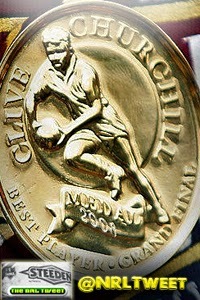 This could go to Extra Time but I think Manly might have to remember how to kick a field goal to win this. I'll be barracking for the Chooks (hey - it's Manly!) but Manly to win as they take their chances to overcome the 1st try to Tupou (and then watch the Chooks not kick for him again - a tactic teams seem to adopt for some inconceivable reason when a big play works) and lead 10-4 at halftime. The Chooks score to tie things up with 10 minutes left but in Extra Time or regulation - a DCE field goal decides the game. Clive Churchill Medallist: Daly Cherry-Evans (will get it for the match-winning field goal, though I think Kieran Foran will be the best player on the field). Easts - To come... sounds like Cordner and O'Donnell are every chance. Liu and Napa would likely miss out. Manly - To come... Hiku on the bench for Gower seems to make some sense if Gower is going to barely play any minutes anyway. Galuvao is not playing. PRE-GAME UPDATE: To come Sunday 6pm but Cordner and O'Donnell seem likely, while Gower may get the call for the Sea Eagles ahead of Hiku. NYC Panthers v Warriors: I really like the Panthers in the Holden Cup - they defend (unlike most other NYC teams) and the Warriors are flaky... go the Panthers 13+. NSW Cup Cronulla v Windsor: In NSW Cup the Sharks have been a class above everyone else and while Windsor have plenty of NRL talent on show - Cronulla should win as they have plenty of their own and it has been playing together for longer this season. Sharks 1-12. What are your tips for the Grand Final?